Last week, I talked a bit about International Dot Day, and posted a retrospective of some of the Dots I’ve drawn over the last few years. Today I want to look a little more closely at Peter H. Reynolds, who created the fantastic picture book, The Dot — the book that inspired T.J. Shay to set his class (and the world) on the great odyssey that is Dot Day. The book, part of the Creatrilogy of The Dot, Ish, and Sky Colors, urges everyone to delve into themselves and to express their creativity. That seems to be what Peter’s life is all about — being a catalyst for creativity. I had the joy of meeting Peter in 2012 at the Stony Brook Southampton Children’s Literature Conference where he was teaching the picture book writing workshop. I didn’t get to experience his teaching (although I know it was an incredible experience, from all reports), but just meeting him, I could feel the creativity and enthusiasm he exudes. I suspect that many people do not know that Peter is Canadian! (Although he has made his home in the United States for the larger part of his life.) You also may or may not know that he has a very creative twin brother, Paul. Peter and Paul head up FableVision, which is billed as “a company dedicated to helping all learners discover their true potential.” Sounds a bit like the focus of The Dot, doesn’t it? They also have created a fabulous book together called Going Places that celebrates (what else?) creativity, and answers the question “What happens when two creative kids put their heads together?” You can see the trailer here on FableVision’s YouTube channel. Peter is also a stellar part of the family-owned Blue Bunny Bookstore in Dedham, Massachusetts. (That’s a store that’s definitely on my bookstore bucket list!) Check out their website. Not surprisingly, the store provides lots of opportunities for kids to express themselves creatively. Here’s a fantastic post from Peter’s blog about how Chris Hadfield (yes, the Canadian astronaut) took The Dot into space! If you want to learn more about Peter, check out the biography on the website of Blue Bunny Books and Toys, or take a look at his own website or blog. 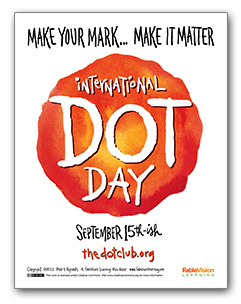 At least two of my writing and blogging colleagues have posted about Dot Day. You can see Patricia Tilton’s post here. You can see Niamh Clune’s post here, and her brand-new Celebri-Dot here. If anyone else has posted for Dot Day, please let me know in the comments, and I’ll add your link. Edited to add: Teresa Robeson and her delightful characters, Doris and Larry, did a Dot Day post as well. Check it out here! He sounds like a really dynamic trailblazer! Good for you, Stacy! I’m pleased to learn you’re planning to make a dot! What a unique post Beth. I am glad you focused on the many aspect of Peter and Paul Reynolds. Had forgotten he was a Canadian. Studying with him at Stony Brook Southampton Children’s Literature Conference was such an opportunity! Peter is so wonderfully imaginative and creative and fun to work with. Great post. Thanks, Pat. Your enthusiastic reports of his workshop every day when we were at that Children’s Literature Conference impressed me very much.